We are a fully accessible facility with elevators and ramps connecting all spaces. Whether you need a meeting space for a group of 6 or a large dining room for 250 people, our wealth of beautiful meeting spaces will offer the perfect setting for your needs. With state of the art technology throughout our facility, we have all of the resources you’ll need to make your experience one to remember. We offer complimentary Wi-Fi access and also have a public workstation with the ability to print wirelessly from any device. The Main Conference Room holds up to 225 people and is the primary lecture space used at Holy Family. This centrally located space includes a fully equipped AV system with automated projection including two drop down screens, DVD player, computer access, built in podium microphone, multiple wireless microphones and WiFi. The space also is home to 24-hour hot beverage service and a Venetian mosaic of the Holy Family. The Monastery Lounge accommodates up to 100 people and is furnished with chairs for conference seating along with couches for rest and relaxation. The AV equipment available in this space include a 75" 4K flat screen TV, podium with lectern mic, wireless mics, DVD player and cable TV. Two identical classrooms feature some of the most beautiful afternoon light at Holy Family. These multipurpose spaces have been used as classrooms, yoga studios, lecture halls, and spaces for small group discussion. Each classroom can accommodate up to 50 people comfortably. The Center’s Main Dining Room holds up to 250 people and can be used for a variety of events. The space includes two levels, an outdoor fireplace and patio and a complete AV system including 5 drop down screens, DVD player, as well as podium and wireless microphones. Consider this beautiful space for your next special occasion, family reunion, wedding reception, rehearsal dinner, private party, funeral reception, corporate event or conference. Learn more about Chef Joe Ethier's celebrated approach to food and menu planning. Holy Family's outdoor patio, located just off the main dining room, is an ideal setting for a cocktail party or for celebrations under the stars. Guests can casually sit along the sitting wall and enjoy the new fireplace. Many groups elect to set up a tent over the patio to create a festive atmosphere for their family and friends. 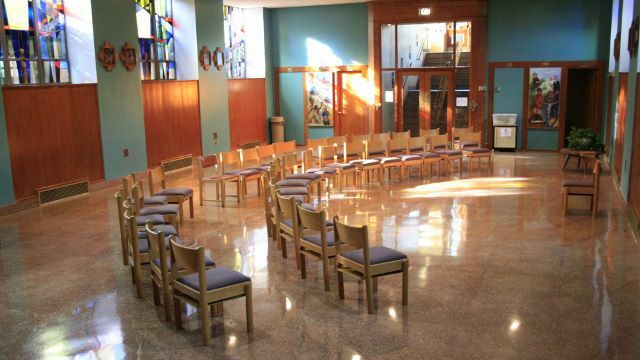 Previously the primary eating space for the community of Priests and Brothers that called Holy Family home, the Monastery Dining Room, which can accommodate up to 100 people is a great space for meals, conferences and gatherings. Formerly the Monastery Library, the Anam Cara Room holds up to 25 people comfortably. The space integrates the warmth and comfort of a sitting and reading room with the flexibility of a small conference space. Natural light streams past many large bookshelves of sacred texts from nearly every religious tradition earth. This is a favorite landing spot for those seeking a quiet, hidden place to rest. For most of its 65 year history, the Common Room was a private cloistered recreation room for priests and brothers to socialize between long hours set aside for work and prayer. The room is two spaces in one--a cozy living room space with oversized chairs and a meeting space for groups. The Common Room, which can accommodate up to 25 people, also features a sink, refrigerator and counter space for refreshments. Holy Family's Main Chapel is the peaceful and meditative heart of the retreat center. Seating is arranged in the round accommodating up to 250 people. Original stained glass windows, an impressive wall sized mosaic, a new concert grand piano, and a new pipe organ add to the uniqueness of this sacred space. For 60 years, this chapel has been a refuge for people seeking inspiration and contemplation. The public chapel is a beautiful space with terrazzo flooring and flooded with color from the stained glass windows on each side of the room. The room is comprised of two distinct spaces including an intimate chapel for liturgy and a flexible multi-purpose space for workshops or presentations. The public chapel has most recently become a vibrant home to meditation and contemplative practice and can hold up to 75 people.